As farm’s around the country were busy planting this spring, we’ve been busy planting the seeds of growth for our farm management software product. Before I discuss our biggest project to date, I’ll show you a couple reports we’ve added to the software. In late-June, we built a weekly profit report that our users can opt into. 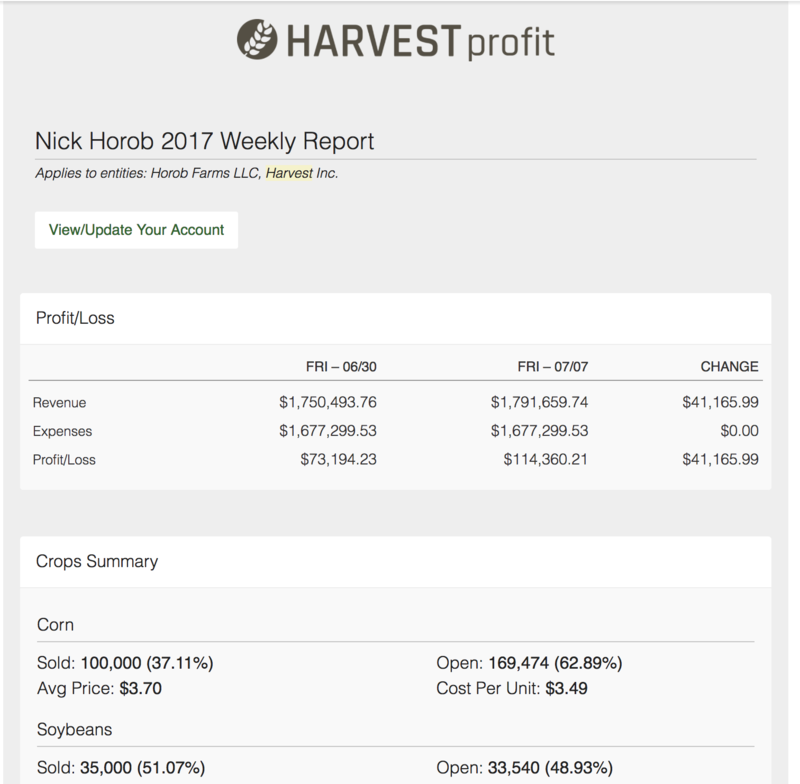 This report gets sent out each Friday and shows your weekly change in profitability. Every successful business needs a bottom line profit goal and farming is no different. In the uncertain world of farming, we can’t change the past and we can’t predict the future. All we can do is control the present. We all know that commodity prices are volatile. It’s easy to get bullish when prices are moving higher and bearish when prices are moving lower. At the end of the day, a focus on your bottom line with a goal in mind makes it much easier to reward rallies when the present themselves. That’s why we are focused on helping your better track your farm’s profitability during the busy times of the year. This report is just one small step in that direction. Much more to come! Another report we’ve added is a total inputs usage report. 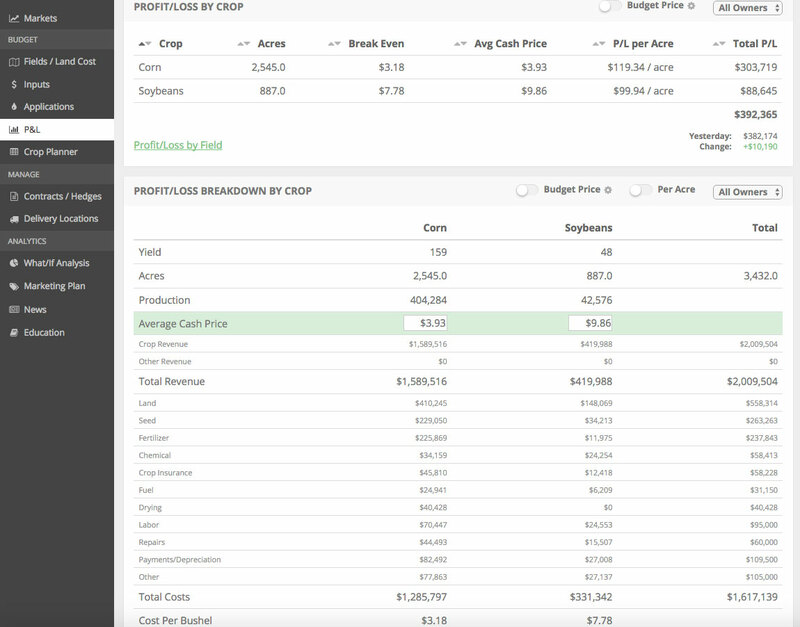 The farm profitability tracking in our software is its “bread and butter”. We allow you to build up your budget (and adjust it to actuals) on a field-by-field basis. When doing this you’ll be able to track your total inputs budgeted and used on your farm. 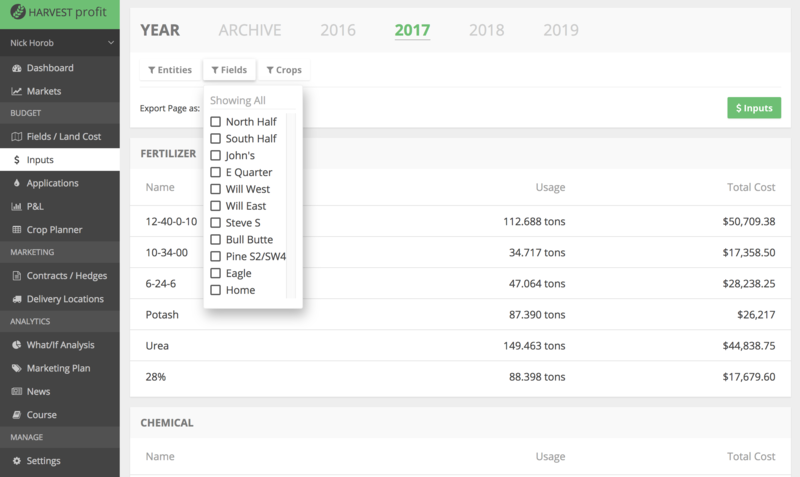 We’ve included a robust sorting feature into this report that will allow you to track budgeted/used inputs on an entity-by-entity and/or field-by-field and/or crop-by-crop basis. In addition to the reports above, we’ve made 17 small improvements to the software based on customer requests. We remain dedicated to continuous improvement. At Harvest Profit, we are a 100% employee owned business. The path to success for us is dependent on adding value to farmers, not selling inputs or raising money from investors. While it isn’t feasible for us to build every feature request we receive, we know that this isn’t our software….it’s our user’s software. With that said, we’ve started working on our largest project today: a mobile app. Being a small team, we can’t promise a release date but know that we’re working hard to give our users an awesome mobile app. We are also excited to announce that Jaryd Krishnan will be joing our team as a Senior Software Engineer and co-owner. Jaryd has vast software development experience, working in the crop insurance and precision ag industries in addition to his most recent role as the Director of Technology at DogIDs.com. He will be a valuable asset to our customers and the business. We are excited to have him! If your interested in a 14-day free trial of our software, click the button below to check it out. That’s it for this report. Have a safe and productive rest of your growing season.